Tuscany doesn't need introductions. Every time I find myself working as a wedding photographer in Tuscany I feel like I’m travelling back in time and being pulled back to the Renaissance period. Everywhere are aristocratic palazzi which one can explore, chamber after chamber, strolling among statues and frescoes which are reminiscent of the cultural sparkle that has yet to fade. Tuscany is also synonymous with the Chianti region and the valley of Val d'Orcia. Here nature unrolls into long cypress-lined country lanes and golden hay bales. These, together with timeless hamlets, evoke an Impressionist canvas with their overwhelming beauty. In Florence we find many wedding venues, all simply exquisite and sophisticated as only art is. Marrying in Palazzo Borghese, near Piazza della Signoria, for instance, will allow the couple to indulge in the building’s luxurious décor as if in a fairy-tale. Not far from Florence is Impruneta where Villa Castiglione sits. This former monastery, built in 1800, has now been turned into a splendid Tuscany wedding location, perfect for couples dreaming of an outdoor reception. A perfect spot for a truly Tuscan celebration is Pietra Antica, in San Gimignano. The location is plunged in the greenery of ancient trees, framed by fountains and brooks. It also offers the possibility to organise a civil ceremony in its premises. The quintessential image of the Tuscan countryside is Villa Vignamaggio, in Greve in Chianti. This exquisite venue offers a breath-taking view over the region’s rolling hills. 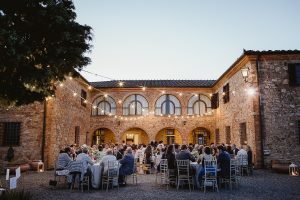 The Abbazia di San Galgano is a renowned location for organising civil weddings in Tuscany, but there are plenty of special places that will also be perfect for tying the knot. Among these is Castello di Vincigliata in Fiesole, dating back to 1000 AD and offering amazing views over Florence. This venue includes a magic Giardino d'Inverno, an indoor but broadly windowed salon, opening onto an internal courtyard. Borgo Castevecchi, in Radda in Chianti, in the countryside of Siena, is another astonishingly unique wedding location. Here it's possible to book out the whole medieval hamlet for the wedding reception. Not far away is Castello di Meleto in Gaiole in Chianti, a spot-on choice for a majestic wedding. This astonishing property, dating back to before the eleventh century, is enriched with splendid frescoed rooms and a fabulous terrace with a view. Finally, how could one disregard the astonishing region of Val d'Orcia? Here, wedding venues charm with their old-fashioned rustic allure. Villa Boscarello, in Trequanda, is the first of these historical manors to come to mind. Tuscany offers many beautiful places to celebrate any wedding or elopement. 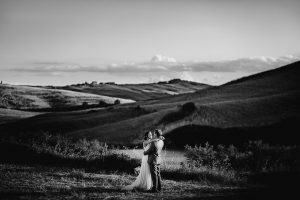 Wedding Photographer in Tuscany, best wedding venues in Tuscany.